Do you feel like boycotting fried foods because of the health hazards of excessive oil? Many people would do same. However, with the entrance of air fryers into the modern world, the problem seems to be solved already. With an air fryer like the Philips XL Air fryer, you can now enjoy your favorite dishes of delicious and crispy treats without the oil and excessive calories. There are many air fryers in the market but our review will be based on the Philip Air fryer XL. If you want to know why this air fryer is so important, follow this Philips Air fryer XL review as we proceed. 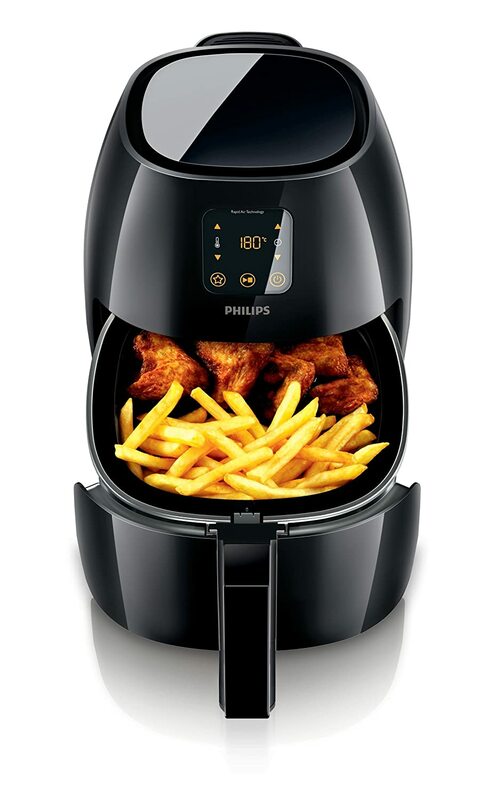 The Philips air fryer works basically by circulating heated air at a very high speed around the food to be fried through a technology known as Rapid Air Technology. It is thus able to cook with little or no oil. It has a capacity that is large enough to accommodate around 2.7lbs, for 3 to 4 people. The Philips Avance XL Digital Air fryer, as it is also known, is a digital air fryer with a digital touchscreen interface that is easy to navigate features a set of preset buttons capable of storing your settings by learning your cooking habits. The Air fryer features dishwasher-safe parts and has a power wattage of 1750W/120V. Now let’s see why you should particularly need this. The Philips air fryer is unique on its own, separated from the herd in a distinct and special way. Many air fryers are able to cook your food in hot air without the oil, the Philip Air fryer is more than capable to do this but it also goes the extra length to deliver on other parts. It’s safety-oriented and comes with a lot of outstanding features that will make even the most ardent fans of deep frying to fall in love. Let’s check out those features below. Capacity/Size: The Philips XL Air fryer has an interior capacity that can contain foods weighing up to two lbs. The whole air fryer weighs about 19lbs and measures about 16.7 x 12.4 x 11.9 inches. 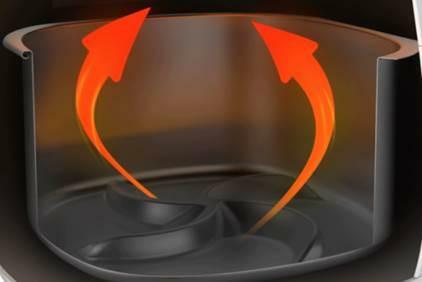 Rapid Air Technology: The company patented this technology and it is the basis on which the air fryer works. The heated air is circulated faster, ensuring your food is cooked to the best of standards. 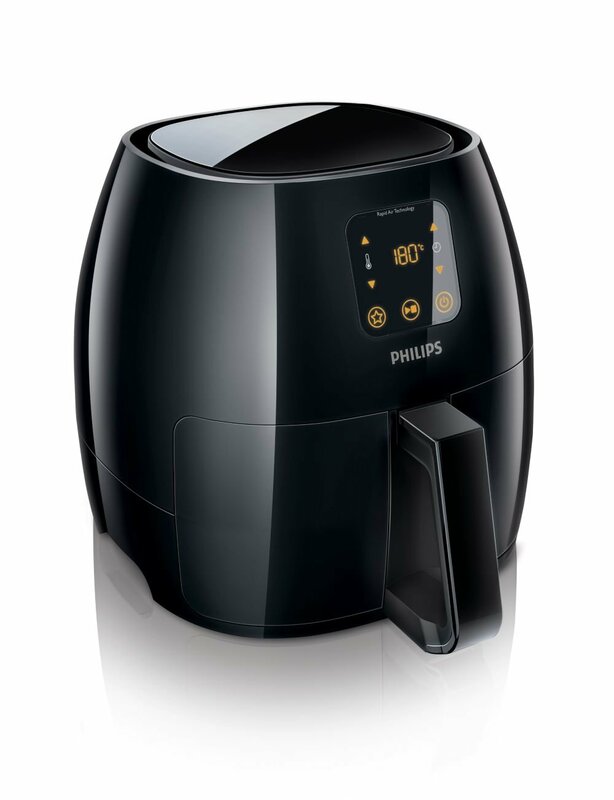 Digital Control: The Philip Air fryer 9240 (9240 being the model number) features easy to understand digital controls that enable you to easily navigate your way through the process of using the air fryer without stress and unnecessary complexity. Preset Options: There are the preset options which you can easily use to cook certain types of foods without going through cookbooks searching all over for the accurate time and temperature to perfectly prepare your food. Smart Preset: The Philips Avance XL Digital Air fryer has this smart preset option wherein you can store a particular time and temperature setting for the food you cook frequently. Temperature Control: The temperature range is between 170F to 390F. You also have the flexibility of options to choose and adjust temperature levels within that range to suit your cooking requirements. This is unlike many other air fryers that do not give you this option to adjust static temperature levels. Easy to Use/Clean: The drawer is detachable and dishwasher-safe, this implies you can easily transfer foods in and out. Thereafter, you can easily toss the dishwasher safe part in water for easy cleaning, it doesn’t get easier than this. Safety Timer: The Philips XL Air fryer gives you the option to set a timer alongside your temperature setting. Along with that, it features an inbuilt timer that automatically shuts off after 60 minutes for cooking and safety reasons. Indicator Light: There is also an indicator light that notifies you of proceedings. It gives a power notification when the air fryer is on and also notifies you when cooking is complete. The air fryer does not come with accessories but there are several optional accessories that you can purchase on Amazon to maximize your use of the Philips XL Air fryer. Some of these accessories include baking pan, baking pan, double layer rack and some others. The Philips XL Air fryer, despite its robust features, is actually one of the easiest to operate. Slide it back in and input your settings through the digital control interface. With the Philips Air fryer, it is possible to check the progress of your food while cooking, to change the positions of the food if need be. After cooking, remove the drawer again, toss the basket and drawer in water and clean easily, you do not have to worry because they are dishwasher safe. The air fryer has a fairly large capacity. Auto shut-off and cool exterior for maximum safety. Healthy and safe foods without oil. Convenient and easy to use and clean. Bulky, a little heavy and may take some space in your kitchen. Even though it is easy to use, you’ll still have to learn a few things but this is how it is with all air fryers. If you still don’t own an air fryer by now, you are missing out on these great benefits, if you have then made up your mind, the Philips XL Air fryer is a perfect option to go with, with the various options and features it has to offer, it’s not hard to understand why it is loved by many. Why not see for yourself how good things can really get with this air fryer, the large size, the outstanding features are all involved to give you the most healthy and stress-free cooking experience, make an investment in this Philips XL Air fryer today and your body would definitely thank you. Air fryers are priceless. They offer a better solution to the problems of deep frying. Excess oil has been linked with certain diseases ranging from heart problems to obesity, diabetes and much more. With an air fryer like the Philips XL Air fryer, all these risks are eliminated. The benefits of the Philips XL are unquantifiable. Getting your hands on one would just be you being fair to yourself. Take the step today, cook healthy, eat healthily and enjoy your delicious meals with the Philips XL Air fryer.